2015 has been a really great year in albums (particularly a strong year for pop artists) and live shows! I didn’t get to write as much about music as I usually do/wanted to, but I definitely got to do a lot of listening. 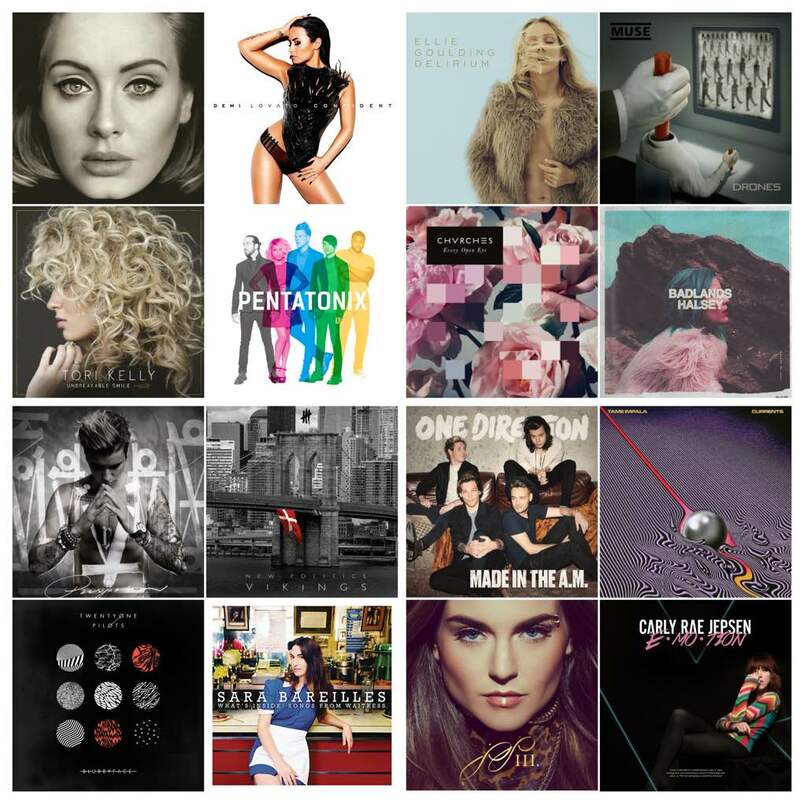 Here are 16 of my favorites albums of 2015 and favorite songs from each, and a few of my favorite singles! Vocal gains are too real in this record. Range, power, and runs throughout this entire thing – please nominate her for a pop vocal Grammy already! The riff/hair queen slays us all with her flawlessness on this record. TFW an a cappella album of originals goes number 1 on Billboard >>> So proud of what these guys have accomplished! I still have this record on repeat… and so should you. Okay y’all. The Target Deluxe version of this album gives me LIFE. 25 tracks of LIFE. I was always a Chvrches fan, but this record made a FANATIC. From start to end, this record is alt-pop perfection. One of my fave new artists! Followed her when she first came on the scene and it is crazy to see how big she’s gotten! Hype Songs: Love Yourself, Sorry, The Feeling, What Do You Mean? 2015 is the year that made us all Belieb. The alt-rock goodness on this album paired with their rap style and r&b vibes makes this one of the most unique/best mainstream releases this year. What can Sara not do? These songs “sound like” Sara, but are also PERFECT musical tunes. I can’t wait to see them in action on the stage! We all miss Zayn, but 1D as a quartet still made it happen! With some 60/70’s rock influence, some a cappella-y moments and their undeniable boy band charm, the guys put out a fun album that is totally worth your time! Need a road trip soundtrack? Tame Impala has got your back. Okay these aren’t albums, but the single(s) and mixtape gave me LIFE and I seriously can’t for the full album next year! The most under-hyped pop album of 2015? Probably.